My first day at Chilenga primary school was one of the most frustrating experiences I have had. I walked into the small blue and white school at 9:00 am amid a chorus of “Good Morning Madame, how are you?” I was eagerly anticipating the difference I would make in this grade 6 classroom. I had visions of lengthy stories being written and children writing me letters in the years to come, thanking me for my help in learning English. I heard so many stories from years past about the satisfaction of teaching at Chilenga and the meaningful relationships built between students and teachers. Almost all of those dreams flew out of my head the moment I realized that most of the children would not even be able to pronounce my name. (I am known in my two grade 6 classes now as “Teacher Wioley”). I quickly realized that concepts that seem obvious to us—like “author” or “beginning, middle, and end”—were too difficult, and what I thought to be a very simple curriculum would need to be edited even more. I learned what it felt like to look into the eyes of someone who truly cannot understand you and feel helpless, having no way to bridge that gap and help them to learn. All of my questions were met with “Yes” or “No” answers, and even reading a 10-page elementary school book was a struggle. It was a true test of my patience and empathy. I left the classroom feeling rather dejected and questioning whether or not this was something I could really do. On the three-mile walk back through the village of Chingalala, followed by a symphony of “Chindele, how are you?,” I was able to voice my frustrations to the rest of the education group and found that each class was at a varying level of literacy, but overall things were going to be tougher than we thought. Back at the convent we heard about how well all the other classes were going and I felt even more discouraged about the work that my group was doing. My team was able to come together to reform our curriculum and help me become more confident about the information I was going to teach the next day. With these adjustments and a new mindset provided by my group, I was able to change my attitude, let go of previous frustrations, and tackle the new day. For my morning class on day 2 I made my way to Chilenga with words of encouragement from Jeff and Josh bouncing around in my head, determined to make a dent in the lengthy curriculum we had prepared – I was going to teach these kids about topics and details whether they liked it or not. My plans quickly changed when the students and teachers gathered around the car the moment we arrived, giving warm welcome to a large supporter of the new library outside of the students’ classrooms. As we were operating on Zambian time, the celebration of song and dance took longer than expected, and I was left with almost no time to teach what I had planned. So I decided to switch things up a bit. After I reviewed what we had learned yesterday, I told everyone to stand up. The kids’ faces, which had previously looked rather bored, lit up at the chance to move around and wake up their bodies. After asking them if they knew any fun games to play and receiving blank stares, I took charge and decided to teach them “Boom Chicka Boom.” I exaggerated my movements and facial expressions and yelled as loud as I could “I SAID A BOOM CHICKA BOOM.” I was met with delighted faces and screaming laughter. The students eagerly responded with a “boom chicka boom,” and when I had them do it “underwater style” they dissolved into giggles. Their laughter was contagious, and I giggled along with them as we came up with different ways to sing and dance to our new shared song. This mutual experience connected by laughter reminded me that we are more similar than we may think. There is a lot of laughter here in Zambezi. There is laughter among our Zambezi family at the convent. There is laughter among the children singing and playing outside our gate. And there is laughter by the people of Zambezi. Sometimes they laugh at us because our accents are silly or because we accidentally say Kanawa mwane instead of Chimena mwane. And sometimes they laugh at us because we are wearing our chitenges wrong or because we dance funny. But this time, I wasn’t being laughed at. We were laughing together. I had found my way in and we were finally communicating. Some might argue that love is the universal language but after this encounter, I believe it is laughter. In this moment, it truly didn’t matter that 21 kids had no idea what a character or a setting was – they were having fun and so was I, and that’s all that counted. Everyday at Chilenga isn’t going to be easy. And chances are that by the end of my time here my students won’t have perfect storybooks, and I might not have made a difference at all. And maybe my life won’t be permanently changed by these people. But the one thing I can count on, the one thing I can look back on and always remember, is the time we laughed together because we were finally speaking the same language. I just can’t tell you all how much reading your posts makes my heart ache. I wish so badly to be back there with you all, but am thrilled to hear of all your adventures this far. Reilly: I’m sorry to say the thing I miss least is the fishy market smell! You are so funny I was laughing throughout your whole blog! I’ll be thinking of you as you cross the Zambezi over to Mize– myself and two others made that trip in the tree trunk canoes and almost tipped over both ways just because of a “slight breeze”. Make sure you learn about the big festive they host over there, it’s fascinating! Hannah: I’ll keep this short because I think you understand the amazing impact your post had on all of us alumni. I remember walking by the foundation walls of the library every day from school. There was no roof and definitely no books, but it still was a symbol of hope for Chilenga. Only two years later and it’s full of 20,000 books!! Holy cow!! The knowledge that is now available to the community is life changing, and you all had a part in that 🙂 thank you for narrating the experience Hannah. Kenzie: WOW! I haven’t met you but I want to send huge thanks for your blog post. Hands are togetherness. You wrote of the power of touch and, whether or not that is a physical touch, I think you have noted the foundation of accompaniment. Break down the barriers, physical or emotional, and accompany everyone you meet by touching their hands and even their hearts. Fantastic reflection Kenzie! Thank you for sharing. Your situation reminded me a lot of mine last year when our health team tried to explain the menstrual cycle to young girls… not exactly the easiest task. It’s so hard to figure out hot to communicate with such a strong language barrier. But I remember the feeling of finding common ground with some other form of communication, whether that be a type of action or body language. I am so happy you found that with laughter! Jeff: All I want to know is where in the Zambezi market you found toilet seats… also, I hope all the chitenge shops stocked up for your arrival! I am proud of you for adjusting to the situation and continuing to try to reach out to the kids. It sounds like both the teacher and students learned something on day two. I hope each day gets a bit easier for all. Keep them laughing and if that doesn’t work, sic Shelby on ’em! Wow. Never have I been so amazed with my little sister!! So proud of you and the work you are doing. Hang in there with the kids and remember that they will never forget the impact you are making in their lives! I love you and can’t wait for you to be back so I can hear all of the stories. What a beautiful reflection..you took me back to my days as an ESL teacher in LA. I am so proud of your compassionate understanding for living in the “present” and understanding and above all EMBRACING your surroundings. Teaching is hard..ask any teacher anywhere in the world! You made it work…BE PROUD!! Let my Venezia know we miss her and love her so much….I can’t wait to hear her stories! 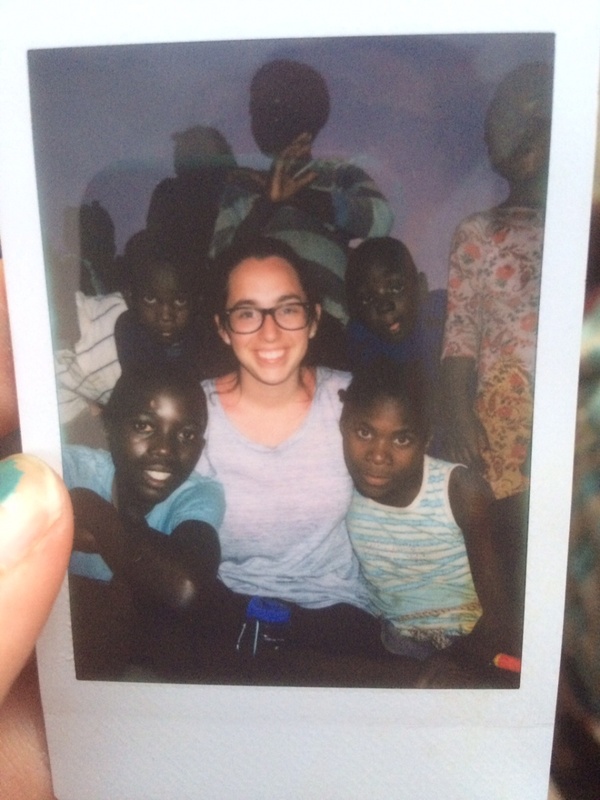 It is so great to read your post and see your beautiful smiling face with all of the kids! And I am so happy that you discovered how laughter can be such a wonderful bridge connecting different languages and cultures. It reminded me of when we were in Germany with the soccer teams and how we didn’t seem to be connecting with the people as in the other locations since we didn’t know each others language, but then when we went to the BBQ and listened to the live music, we were able to connect over the music and dancing. We are immensely proud of you and we are so excited for you to have this enriching experience that is providing you with so many opportunities for emotional and spiritual growth. We can’t wait to hear more about your adventures with the Zambezi community. We have enjoyed reading each and every post on the blog, and like many others have mentioned, the depth and richness of the writing along with the great pictures makes us feel like we could be right there with you. We really do look forward to each new post. Keep your spirits up and don’t be discouraged about your first days of teaching. It can be a challenge to connect with all of the kids when you speak different languages, but it looks like you are all well on your way. Don’t forget about music and dancing as another way to connect!! Take care of yourself and keep up the great work. We love and miss you and can’t wait to hear more. I love your African name of Wioley. I think its adorable. At least they are trying. I have had a foreign name in the U.S. my whole life with the same issue . Eureka and Paprika were my substitutes. Anyway, based on your picture you are NOT lacking in popularity and obviously you made a connection with laughter and humor. Hang in there and I hope it gets easier for you! Love all the posts! Keep them coming! Riley, Megan Wertman (Zam Fam 2011 Alum) here. You’ve learned so much already! These kids and these experiences WILL change your life, in ways you never imagined. These challenges may make you feel defeated now, but you grow through and you have already learned to smile through it all. Sometimes you will feel overwhelmed and sometimes time is your worst enemy. Take every day and make it new, and remember that you don’t have to change all 21 of your students’ lives, but you will change at least one. Connect with students when you can, take your time, and sing as often as possible in your classroom… they love that. LAUREN! (Megan from Housing). I had NO idea you were going to Zambezi! I loved your blog post, but didn’t have time to comment at the time! A lot of the students I met and interacted with were concerned that I would leave Zambezi and forget about them. That’s not possible. Remember that they see this Zags community for 1 month a year, and all they want to know is that they matter to you. When Josh and family returned to Zambezi for Christmas time after adopting Grace a few years ago, I sent him with a small envelope of photos for my friends Nancy (who should be 16 or 17 now) and Mudondo (who should be 8 or 9 now), and Nancy sent me a package back…. with some of the photos inside! They were still concerned that I would forget about them, so they sent the photos back for me! Just love on them and hold as many hands as possible and watch the sunset WITH children every day. They might exhaust you and they might confuse you, but say yes. Say yes to everything. Your time is short. Joel Handsome, have you found Mudondo yet? I miss your smiling face in the office every day! So glad to see a post from you. You’re doing an incredible job, I’m so proud! Keep up your hard work. Miss you! Riley, I realize this is a few days late, but your post made my day! I love your insights on connectivity and togetherness being achieved through laughter, I don’t realize that reality hardly enough, but it is evident. Best of luck in the coming weeks of teaching, you are doing great things! I loved reading your lovely words… I felt like I was there laughing with you and those sweet cherubs. We send you all all love and prayers and keep smiling and the photo is so darling.